With the continuous loop, Brushtec will be able to streamline production with trimming, but also flag, and clean inline when needed. 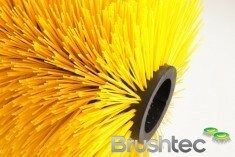 The brushes are placed onto a vice, atop a chain, which revolves and takes each brush through the processing stations. The manual insertion can be done anytime a vice passes the operator in the open position. Ejection of the brush may be carried out manually, or automatically. Despite the machines multipurpose function, and high capacity it is still able to do all this at high performance and be a compact size.